Mix Wheat flours gram flour, salt, chili powder, turmeric powder and mix well. 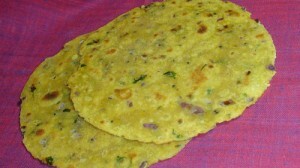 Make powder of fenugreek leaves and mix it to the flour. Note: It can also be cooked in an oven or tandoor.